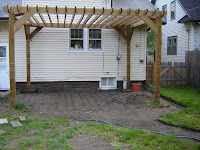 My goal for this late Spring is to build a patio under the pergola I built last year. Here are three photos documenting the progress. 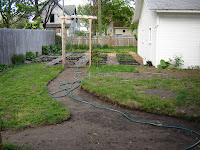 The first picture is what will be the path heading back to the garden. No, that's not the pergola. This is the pergola. And the outline of the patio where it hits the house. 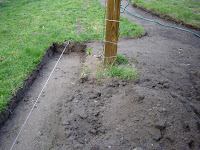 And this is the slope I'm digging -- from about 3" below the string near the house to about 7 1/2" below the string where the path starts to about 12" below grade where the path hits the garden. Though by the time I get to the path the drainage wouldn't necessarily need to go away from the house, but could drain off the sides. And that's less digging, so it's probably what I'll do. You might notice that there are posts in the way. To make matters more difficult, there are currently grape vines growing up the posts, so I plan to leave about a 2' square area around the posts to accommodate post and vine. That area I'll build up with some sort of lumber to create little planter-type things. Maybe "late Spring" is a good start date, but it looks like it might be tough to finish by late Spring.